(Stafford Springs, CT)—Stafford Motor Speedway will host the 45th Annual NAPA Fall Final Weekend on Saturday and Sunday, September 30 and October 1 to close out the 2017 NASCAR season of racing. The NAPA Fall Final will host the penultimate race of the 2017 season for the NASCAR Whelen Modified Tour as well as determining the 2017 Whelen All-American Series Track Champions. The NAPA Fall Final will also play host to the Mr. Rooter Truck Series. The NAPA Fall Final Weekend will kick off on Saturday, Sept. 30 with practice sessions for the Whelen Modified Tour, Stafford’s NASCAR Whelen All-American Series divisions and the Mr. Rooter Truck Series from 10am to 2:15pm. The Whelen Modified Tour cars will take the track for time trials to set the field for the NAPA Fall Final 150 at 2:30pm. Stafford’s NWAAS divisions and the Mr. Rooter Truck Series will qualify for their features at the conclusion of NWMT time trials. Feature events for the SK Lights, Limited Late Models, DARE Stocks, and Mr. Rooter Truck Series will conclude Saturday’s festivities. The NAPA Fall Final Weekend continues on Sunday with the famous NAPA Pit Party, a meet and greet with drivers and teams, taking place from 11:00am to noon on Sunday, Oct. 1. 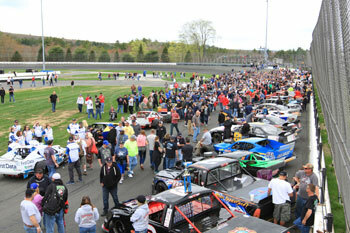 Feature racing will begin at 1pm with the SK Modifieds® first on track followed by the Late Models and the Whelen Modified Tour. Discount tickets are available at your local participating NAPA Auto Parts Store. The NAPA tickets include general admission for both days along with a luncheon buffet on Sunday, all for only $38 per person. For a list of participating NAPA Stores, please click the PARTICIPATING NAPA STORES link found at the top of the www.staffordspeedway.com homepage. Tickets for the 45th Annual NAPA Auto Parts Fall Final Weekend are priced at $40.00 for adult general admission tickets, $5.00 for children ages 6-14, and children ages 5 and under are admitted free of charge when accompanied by an adult. Reserved seating is priced at $42.00 for all ages. All NAPA Fall Final tickets are good for admission on both Saturday and Sunday and ticket prices include 10% CT Admission Tax. For more information on the 45th Annual NAPA Auto Parts Fall Final Weekend, or to order tickets, contact the Stafford Motor Speedway track office at 860-684-2783 or visit us on the web at www.staffordspeedway.com.